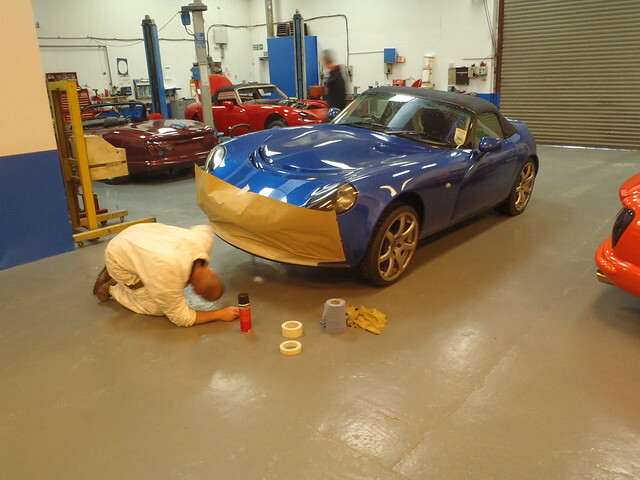 Friday was a very long drive up to TrackVRoad for some tweaks and checks to the car, then to Central TVR (also the TVR Power Bodyshop) for a quick fix to the underside of the front splitter. 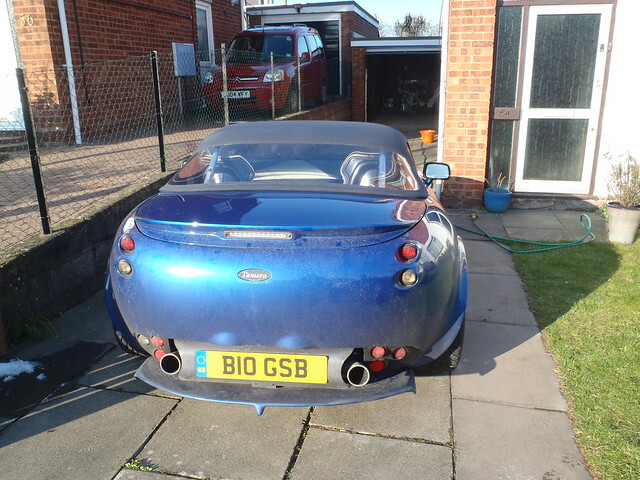 The car spent its first night outside for many months, as it was parked on the driveway ready for an early start, but hidden behind the Mondeo. The evening before I had used my new CTEK MXS3.6 charger for a while to make sure the battery was topped up. Hopefully with its cigarette lighter adaptor this will be an easier charger to use than having to use the bulky Anderson connector (working by touch since that side is against the garage wall). This charger will also do slightly more clever charging than my existing Halfords charger (which is still good and has never failed me). Despite the weather forecast saying that temperatures would not drop below freezing, the gritter came down my road at 11pm, so the poor TVR had to have its first drive in gritty conditions. A 5am alarm lead to a 5:45 departure equipped with some food and drink for the journey and a number of CDs. We had only experimented with music in the car once before, but because this was a long journey by myself I loaded up some fine country music to take with me. Oil temp at start was about 6 degrees, and the car kept flashing up 5 degree (no need for gritting) frost warnings which dissapeared again before I could cancel them. 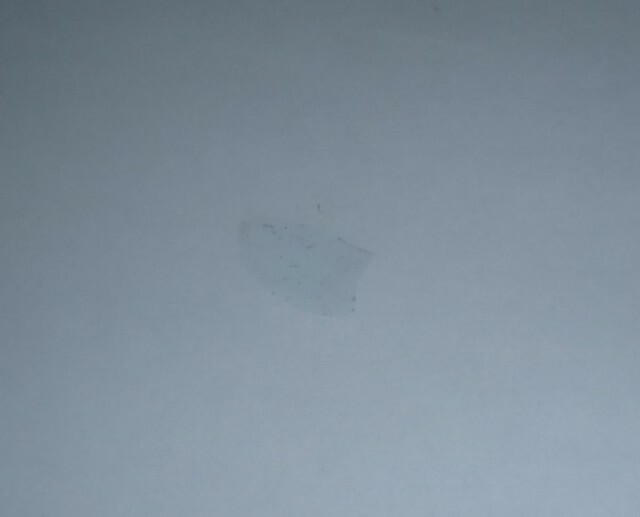 This stopped after a couple of minutes. 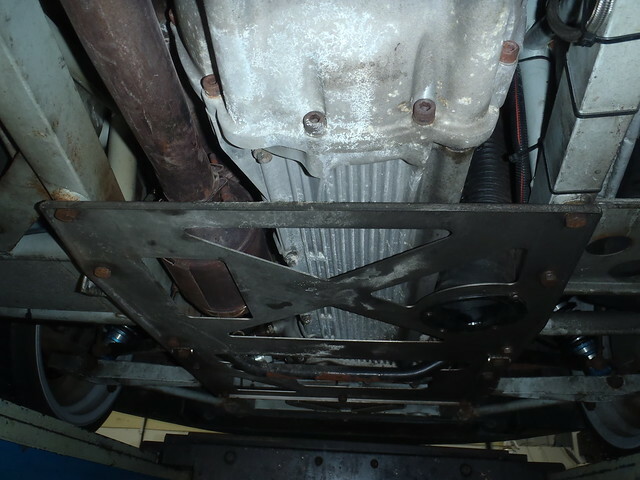 By the time I reached the motorway the car was warmed up and I have found a nice balance on the heater (I am glad we did the fan setting fix), and with some music on I settled into a long 70 mph drive. Apart from an annoying section of 40 mph roadworks. The music was audible, I wouldn’t say it was great, and I had to turn it up fairly loud, but the new speakers worked well. Following an easy drive up, I filled up at the Texaco garage at the edge of Clitheroe with Super Unleaded (28.5 mpg at that fill) and continued on to TrackVRoad, arriving just after 8:30. Richard was there, and I chatted with him, asking a lot of questions, until about 9:30 when Ian was ready for my car. 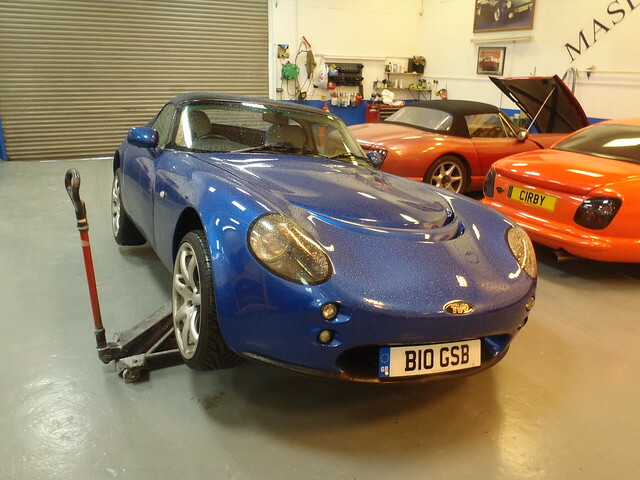 Ian measured by TVR’s ride height and found that the front was 20 mm too low, probably due to suspension settling since new. 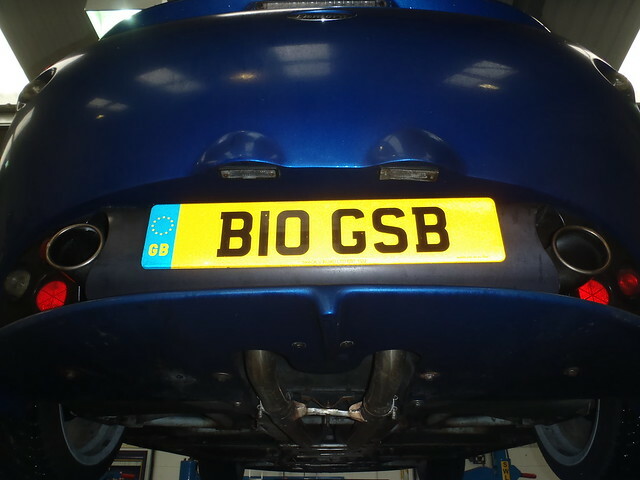 The rear ride height was ok. The car went up on the ramp and it seems to be a simple job to adjust the ride height. 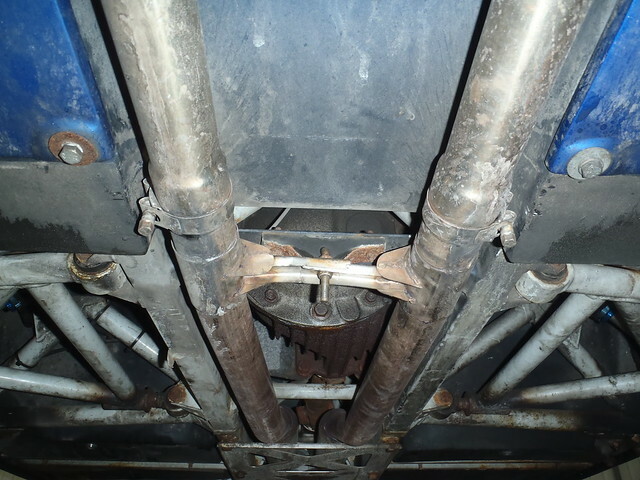 While it was up there, Ian showed be around the underside of my car, pointing out and explaining things, which was very useful. 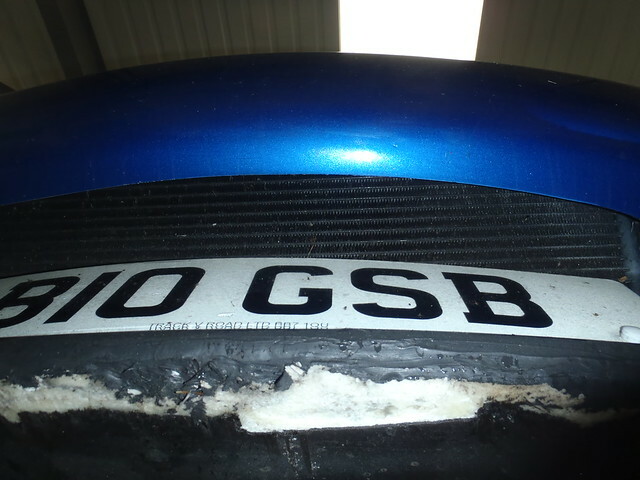 Asking Ian about the damage to the front splitter, he said it wouldn’t cause any problems. 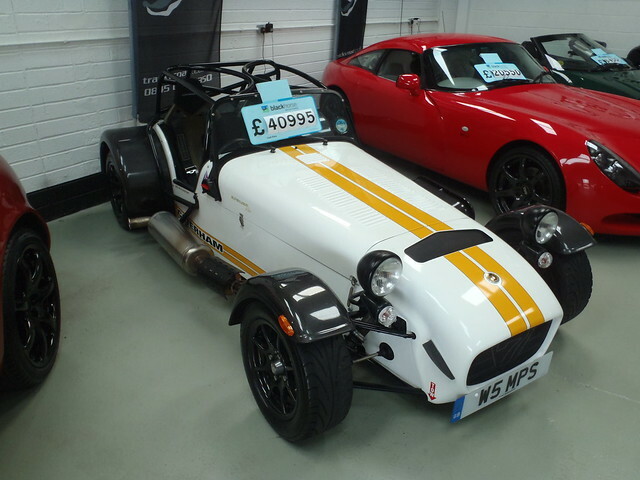 I had a look at some of the TVRs for sale while I waited. With all done, and after another coffee, I headed South into a big rain storm on the M6. 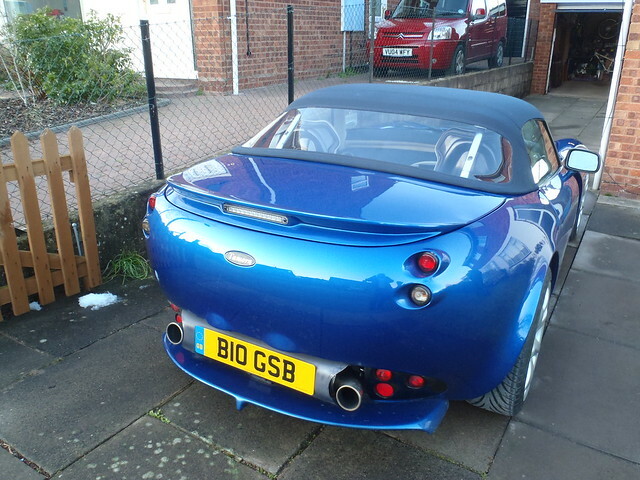 This was quite heavy rain, but the TVR felt fine, and no sign of any leaks. The weather cleared for a while and then as I entered Stourbridge it started to rain again. I filled-up again at the Shell station so I could get a tank of V-Power, and my fuel econmy for that bit of the drive was 29.1 mpg, a new record, despite some time spent idling. 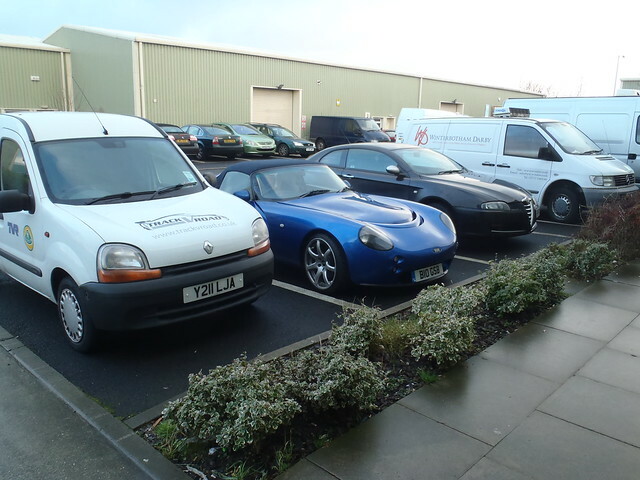 If you drive to Central TVR / TVR Power Bodyshop, do not join their lane from the main road. This road was a mass of interconnected potholes the size of which I had never seen before. I picked my way through very carefully. Approach and leave from the other end of the road, even if it is a longer way round. Adrian, who I had spoken to on the phone, was not there, but 2 other chaps helped out. They cleaned the front of the car, lifted it a bit, then masked off the paintwork and sprayed over the damaged bit of the splitter. 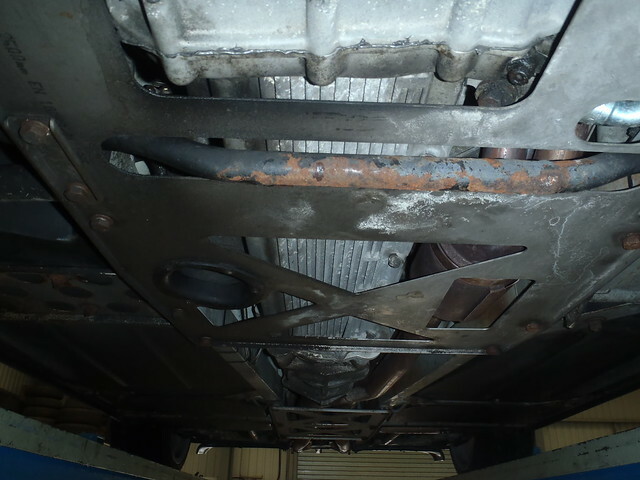 They commented that it had been repaired before, and that they could do a proper job to make it as good as new. 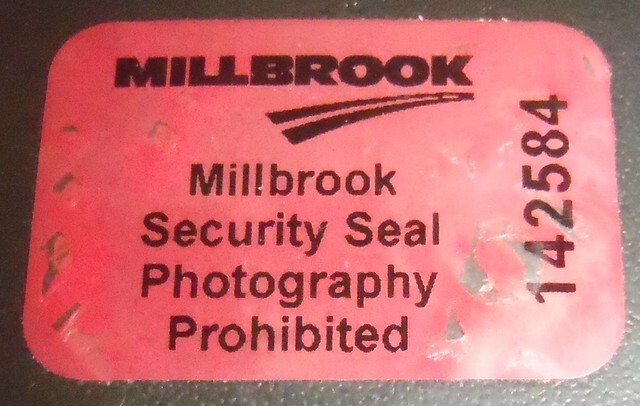 However, since it is functionally fine, and the damage is not visible unless you look carefully and from floor level, I plan to keep it as it is for now. 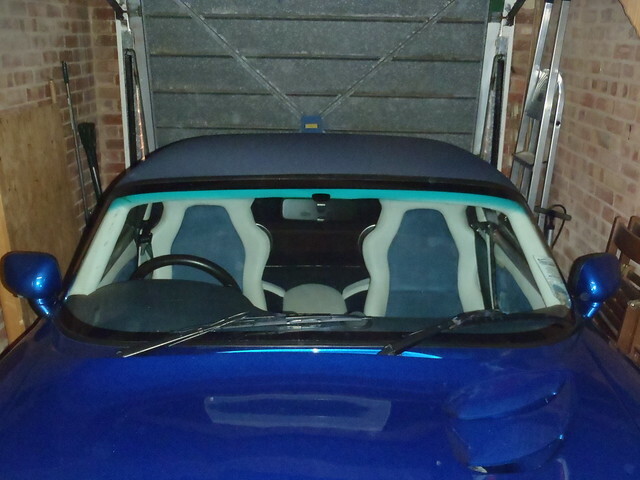 With that done I finished the drive home, and for the last bit it wasn’t raining, so put the car awy with dry bodywork but probably a but damp underneath. 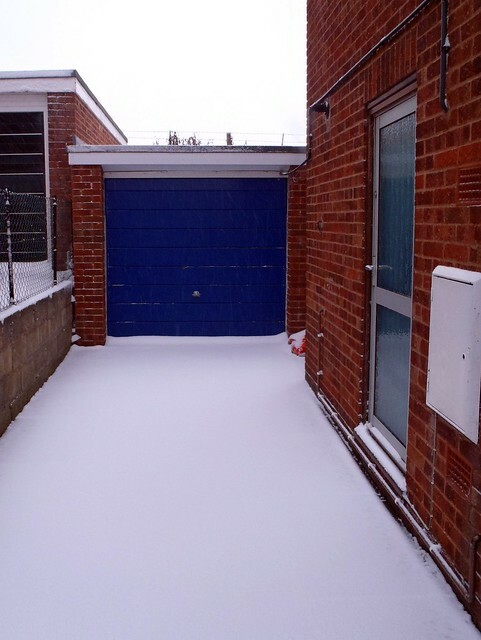 I put on some heating and ventilation in the garage to help with this and kept that on for about 7 hours until I was sure everything was dry. 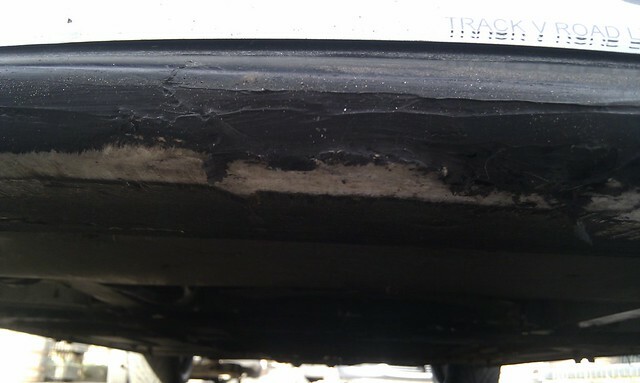 The big storm on the M6 should have given the underside a decent clean. The car had driven perfectly over the 330 miles, with some occasionaly bursts of acceleration. The ride is fine, the seats are comfy, wind noise is ok, but exhaust noise at motorway speeds is annoying, and then turning the radio up so I could hear music over it was probably a bit too loud. Not sure what I will do for very long road trips. The car now really needs a wash, but I want to buy new washing kit to use on it to keep the paint as immaculate as possible. It is also going to wait until warmer / dryer weather before it gets its first wash and polish. 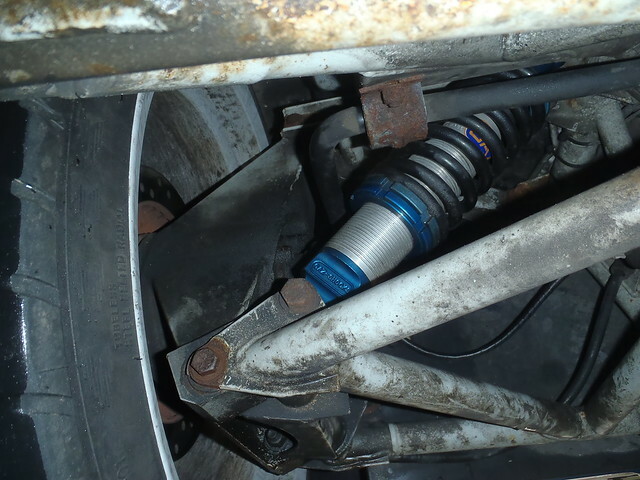 I measured the ride height before any adjustments are made, and after 800 miles of driving since the suspension was fitted. I used a stack of DVDs, with some very thin DVDs to see what could be slid under the relevant part of the car. I then measured the height of this stack with a ruler. This is probably accurate to a few mm. Given these are an empty car, add 2 people and the heights will be lower. A few phone calls this morning lead to progress on a few fronts. 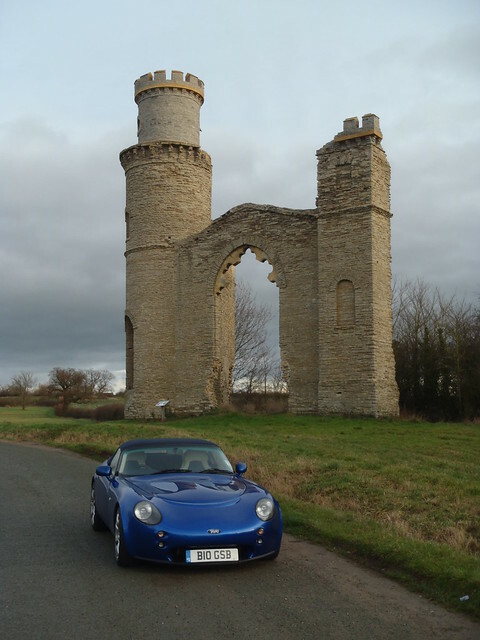 I had a chat with Chris from Centre Gravity about raising the TVR suspension, then corner weighting the car and tuning the geometry for my requirements. This was very useful, and progress will be written up here. Following some e-mails with Craig at TrackVRoad, I spoke to Richard. 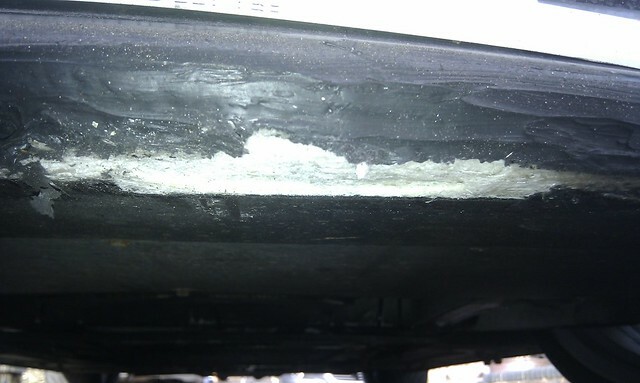 The damaged fibreglass isn’t a problem if I use the car, which is good. 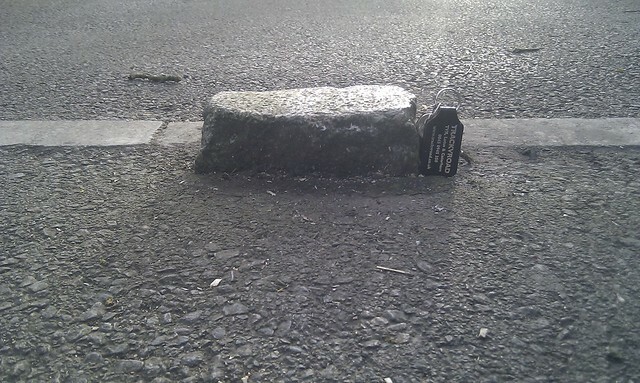 I could spray the damaged bit with some stone-chip protection from Halfords if I wanted to. Their bodywork chap is not available on the day I am thinking of driving up, but they are happy to raise the ride height a little. 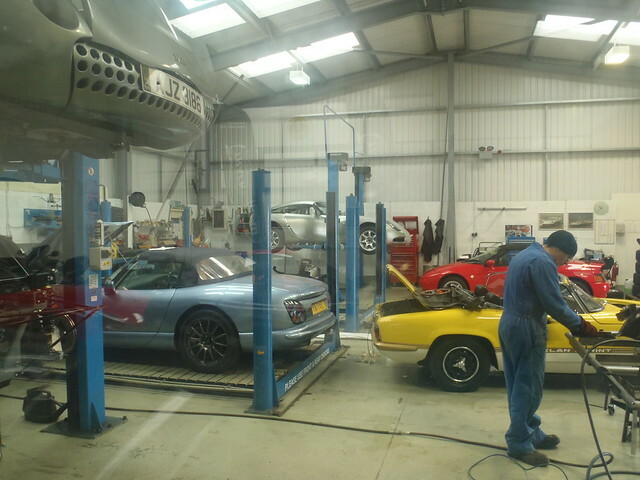 I spoke to the TVR Power Bodyshop, who are not too far from me. 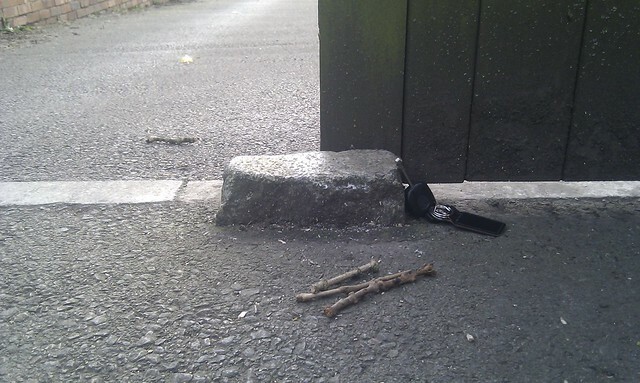 Adrian was very helpful, and thought he could cover over the damage while I waited for £5. I might try to see them on the way back from TrackVRoad. 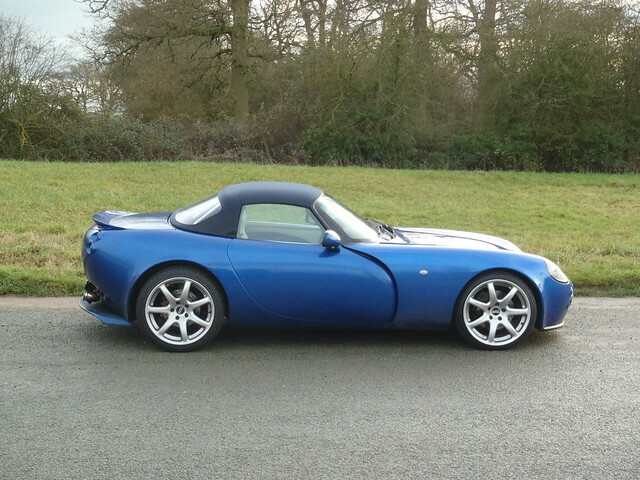 He also suggested that for £50 / hour one of their guys could raise the ride height, but TvR should have done that. 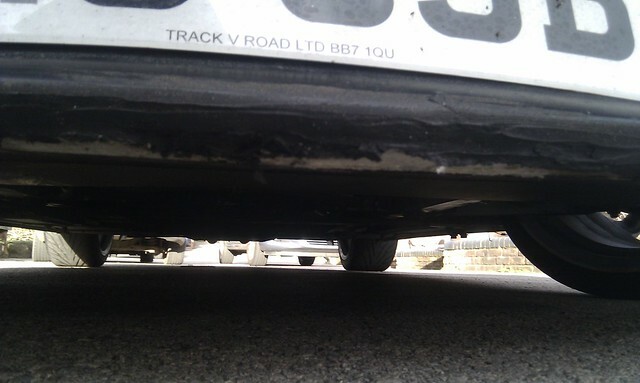 When we bought the car, Richard at Track V Road said we would scrape the front splitter. For nearly 3 months we avoided this, until today. 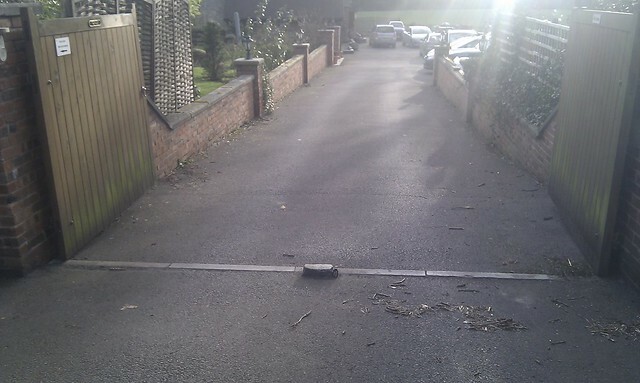 An innoccuous-looking driveway central stone at a relative’s house caught the underside of the front splitter. Thankfully, it didn’t catch the front, just the underside. 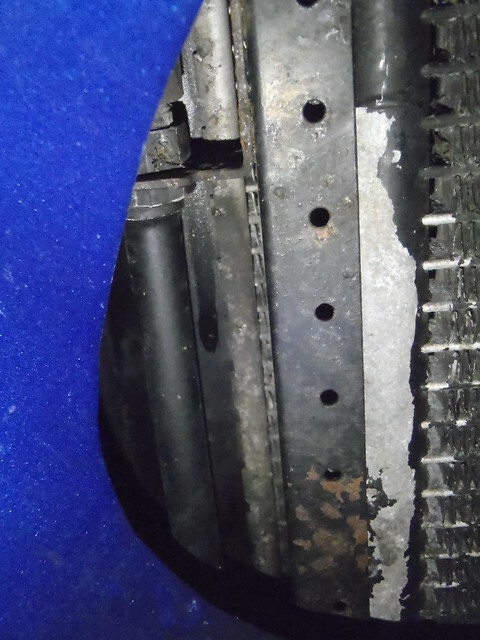 Even so, it has gone through the surface protection and scraped away a little glass fibre. 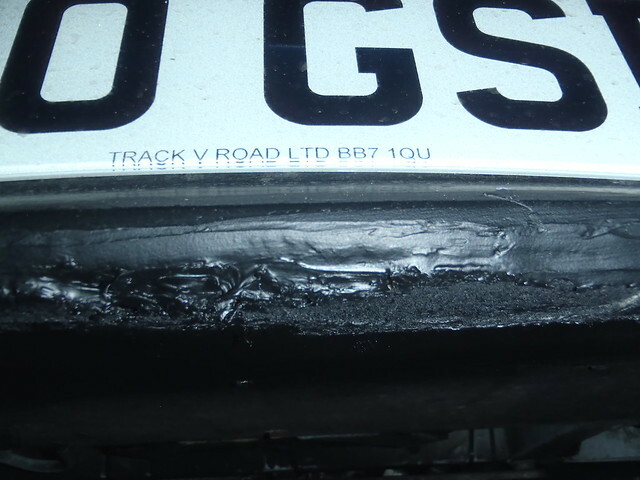 Maybe something that can get patched-up at Track V Road if I make it there this week, which is planned. My wife was driving when it scraped – she suggested I got out to look at it, I said it would be fine. I was wrong. 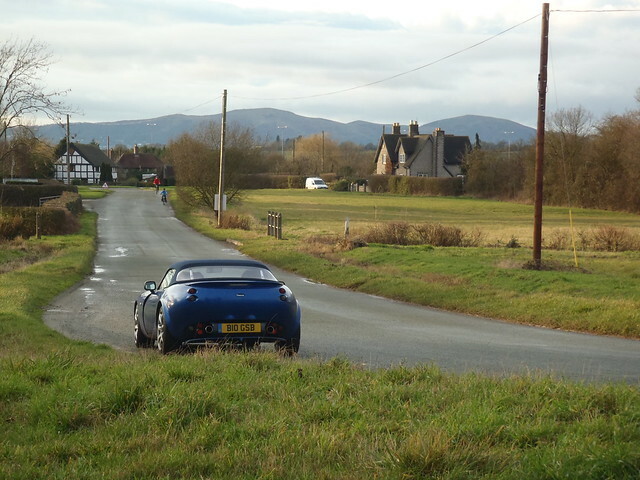 We have had some good weather over the Christmas break, so the TVR has been out twice more since Christmas. Once with the Targe Top off and with a friend in the passenger seat who hadn’t seen the car yet, and then once with my wife driving the 1st half, and me the second the half of the drive. 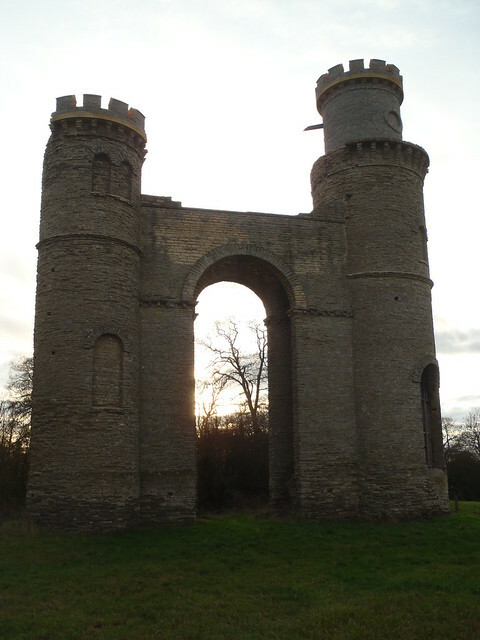 The first drive was out through some country roads to visit a strange construction, which looks like a castle, but was built in more recent times to provide interesting landscape features for a local stately home (Croome Court). The second drive repeated some of the same route, and included stopping off at a friends house. 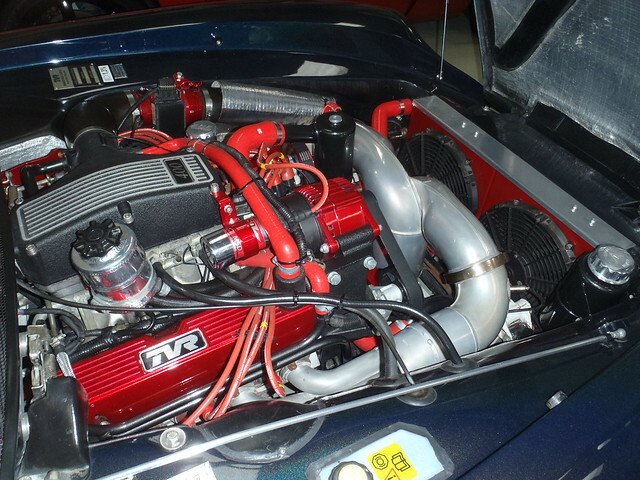 They have just bought a Monaro, so I thought I would bring the TVR over. The Monaro sounds likes it has been a bit of a tail-happy handful, whereas the TVR has behaved impeccably so far – but I am driving it carefully. 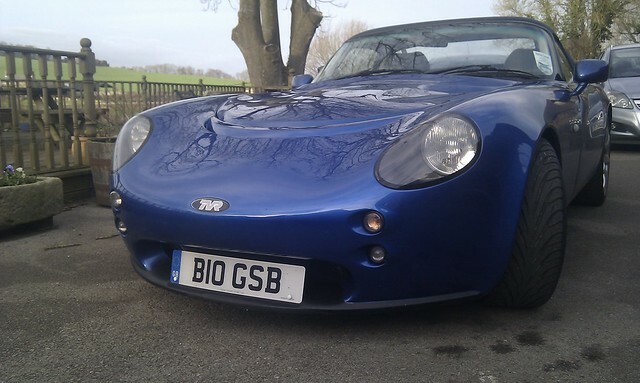 The TVR was fine on both drives, oil temps went to 70, water temps in the range 70 – 80, and oil pressures all looked good. I want a more accurate tyre pressure gauge to make sure I am not running them a bit firm (currently using the on-pump gauge), and I have a new tread depth gauge to test. The weather was nice and dry, and there were decent levels of grip when using more vigorous acceleration / braking. I am very much looking forward to our CAT Driver Training day, but it will not be for at least 1 month due to a lack of free time.